After the more-portable JBL Link 10 and 20, the JBL Link 300 represents a change in strategy for the audio brand. With the arrival of Google Home and the rest of the smart speaker category, most brands have been trying to compete with Google on looks as well as sound quality - and a lot of the time they haven’t really managed to win on the former. This isn’t a huge surprise, mind you. When you’re trying to nail that ‘speaker that doesn’t look like a speaker’ look, it’s hard to beat the product that - for most everyday customers - best embodies that ideal. So, with the JBL 300, JBL are doubling-down on their heritage as an audio brand. This is a speaker that looks like a speaker - and the focus here really is on the sound quality. It’s a simple formula, but one that’s likely to win the brand some fans. 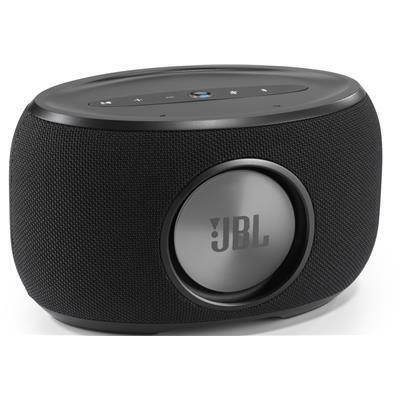 Though, visually, it easily fits in easily amongst the rest of JBL’s mesh-fabric portable speakers, the Link 300 reminds me a lot more of the modern home speakers offered by Harman Kardon than anything else in the smart speaker space. Rather than echo the look of a Google Home as other brands have done, JBL have let the Link 300 look like a speaker naturally expanding in size to suit its heightened audio capabilities. At a glance, the JBL Link 300 is almost football-esque in its shape, with a horizontal array of buttons acting as a crown on the unit. Sure, the final result of this approach is a little bulkier and wider - but there is a pay-off for it waiting in the wings and, assuming you’re willing to pay that entry-price of a larger footprint versus the regular Google Home, it’ll probably suit most living room environments where it’s set up. There is one key difference worth noting here. 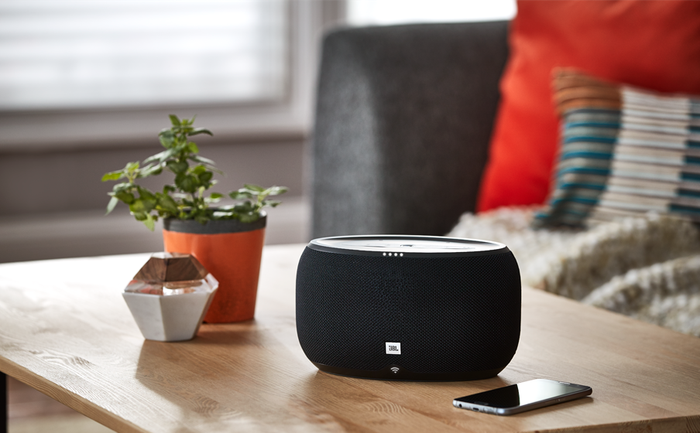 Unlike the other JBL Link smart speakers, the Link 300 has no portable battery life. You’ll need to permanently have it plugged into a power socket as you would a regular Google Home. While this does dilute the specific flavor of smart speaker that JBL are offering, I don’t actually think this necessarily ends up as a huge loss in the context of the overall experience. The parallel integration of portable speakers and smart speakers has always been a bit awkward and clunky and while that portability might be a big part of JBL’s brand, it doesn’t really make a huge amount of sense to double down on it here. In terms of smarts, you’ve got everything here you’d get out of any Assistant-powered speaker. You can ask the Link 300 questions, tell it to play music, check the weather, set reminders, consult your calendar, listen to news bulletins and interact with both connected smart appliances and compatible third-party services. Obviously, given the 89mm woofer and 20mm tweeter in the JBL Link 300, it might not really surprise you to learn that it sounded markedly and significantly more detailed and crisp than what you can get out of the regular Google Home - which is perfectly listenable up-close and in isolation but often prone to distortion over larger distances. Compared directly against more comparable fare like the Sonos One and Panasonic’s GA-10, the JBL Link 300 delivered really a rich and vivid sound. Barns Courtney’s The Attractions of Youth sounded more lively and sometimes effervescent on the Sonos One but there was definitely a weight to the bass coming out of the JBL that’ll win it some fans. I don’t know if I couldn’t confidently declare that the fidelity here is ahead of either speaker, but it’s definitely in the same ballpark - and, given the asking-price, that might be enough for some. At $349, the JBL Link 300 is marked more expensive than the regular Google Home but, given it’s beefier audio specs, it comes in just below the similarly beefy Panasonic GA-10. Between these three products, it feels like most customers are going to gravitate towards either the one they like the look of best or the one that supports your voice assistant of choice. Take your pick. If there's any real drawback to highlight here, it's that the JBL Link 300 doesn't really add to the larger smart speaker equation in any meaningful way. It's just a bigger, less portable take on what JBL have done before. This formula might yield better results than the Link 10 and Link 20 did but, at the same time, it's hard not to wish for some kind of unique call-out that separates this product from the other heavy-duty smart speakers out there. 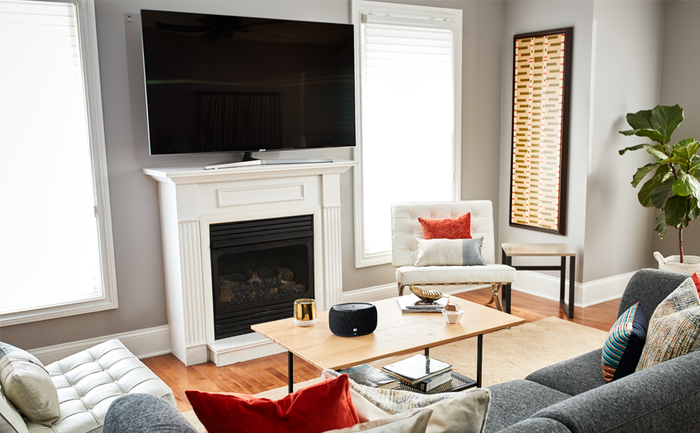 Freed from the sometimes-awkward reality of being having to serve as a portable Bluetooth speaker and a smart speaker, a newfound sense of focus allows JBL to deliver what might just be their best smart speaker experience yet. The JBL 300 abandons the experimentalism found in the rest of the Link range, and delivers predictably solid results in lieu of it. If you're looking for a compelling Assistant-powered alternative to the Sonos One, you've found it.